Join us for our annual Christmas Shopping Evenings on Thursday 6th December and Tuesday 18th December between 5pm & 8pm. Indulge in complimentary mince pies and mulled wine as you enjoy festive entertainment and listen to carols being sung by The Young Voices Choir. The Young Voices Choir is a group of local children who love singing in harmony, learning together for their own and others enjoyment. Their ages range from 5 to 15 years and any funds raised at their concerts helps to provide each singer with music copies. Shop local produce and artists in our Visitor Centre like Lucy Pittaway, Alex Clark, Stuart Clarkson, Barn Craft and amazing food producers like Masons Gin, Black Sheep Brewery, Yorkshire Flapjack and of course our award-winning selection of cheese. You can also create your own hamper, full of your favourite Wensleydale Creamery cheeses, local chutney and crackers. The perfect gift for anybody at Christmas! Our wonderful team will wrap it for you too! Take advantage of 20% off in our Gift Shop. Excludes alcohol, promotions, and Calvert’s Restaurant. In store only. You will also be able to sample our brand new Christmas Limited Edition cheese as well as popular favourites like Mince Pie and Gingerbread flavoured cheese! We will also have a Christmas raffle, with all proceeds going to the Young Voices Choir. 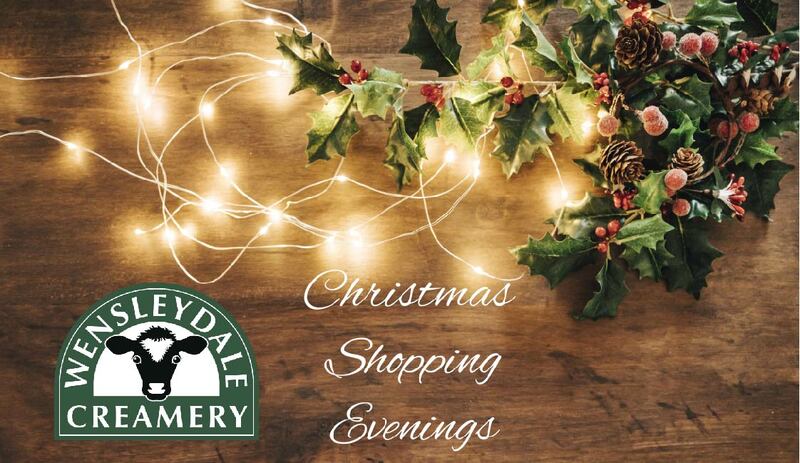 There really is something for everybody, so join us for a Christmas Shopping Evening to remember.